This chapter explores the intertextual nature of video games. Video games are inherently intertextual and have utilized intertextuality in profound ways to engage players and make meaning. Youth who play video games demonstrate complex intertextual literacies that enable them to construct and share understandings across game genres. However, video game literacy is noticeably absent from formal education. This chapter draws from bi-monthly meetings with a group of youth video gamers. Video game sessions focused on exploring aspect of video game play such as learning and civic engagements. Each session was video recorded and coded using You Tube annotation tools. 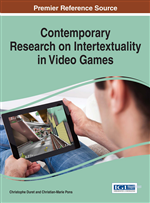 Focusing on intertextuality as an organizing construct, the chapter reports on five themes that emerged that were then used to help explore the use of video games as teaching tool in a grade 11 Language Arts class. A critical concept that emerged was the idea of complex intertextual literacy that frames and enables adolescents' engagement with video games. Video games have increasingly become part of the lives of today’s youth (McGonigal, 2010); they seamlessly connect to the myriad of other texts youth engage with on a regular basis. Although video games have often been dismissed and disparaged by adults through media, schooling, and parental concerns (Sabella, 2010), despite no empirical evidence other than excessive engagement (Subrahmanyam et al., 2001; Carnagey & Anderson, 2010), there is evidence to the contrary indicating the benefits of video games (Boot 2007; Gee 2005). However, we rarely see teachers embracing this modern phenomena as part of the school curriculum, leaving their students to navigate these new media realms without guidance (Squire, 2005). In this paper we consider the potential of video games to form a critical space to engage students in meaning making, enabling them to engage in thoughtful dialogue on the ideas that flood into their digital spaces through the intertextual constructs used in video games. These intertextual constructs enable gamers to share complex meanings and sophisticated insights on human interactions. To interpret how intertextuality operates between game players and between players and the game we have used a complexity theory framework to explain how our gamers, as agents of an eco-system of gamers, learn how to play and adapt to the challenges of video games. In this study we tap into the complex collective consciousness of youth video gamers who self-organize around the challenges and narratives of popular video games like Halo, World of Warcraft and Fallout that are taken up by the youth video gaming culture. In agreement with others we note that adolescents are provided incentives through video games to make connections to a wide array of diverse print, visual, and multimodal texts found online, on television and film, and in school (Jenkins, 2010; Kahne, Middaugh, & Evans, 2009; Spence & Feng, 2010). We feel that considerable time and resources are expended in developing and playing video games, and it is vital that educational researchers pay more attention to the knowledge and understandings of the world that gamers are acquiring and using to create their own texts.